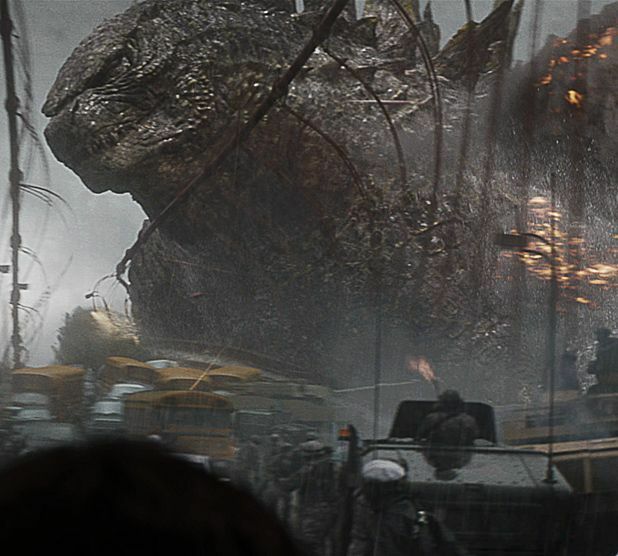 Having impressed with his low-budget debut Monsters, British filmmaker Gareth Edwards now delivers a visually stunning, if emotionally flawed, monster-sized blockbuster with Godzilla. A self-confessed Godzilla geek, Edwards has stayed true to many of the origins of the original Toho creation (directed by Ishiro Honda way back in 1954) by playing once again on nuclear fears and nature’s ability to remind mankind of its power. As such, the film unfolds in serious fashion with much of the devastation taking its cues from real-life disasters that viewers can eerily relate to. But it also knows how to deliver the type of spectacle befitting a movie of its size and boasts several jaw-dropping setpieces. There are shortcomings, too, though. The film struggles to be as affecting as it should be and the last act, while impressive on many levels, sadly still comes down to a ticking bomb scenario. The story picks up in 1999 as nuclear physicist Joe Brody (Bryan Cranston) fails to prevent a catastrophic meltdown at Japan’s Janjira nuclear plant that also claims the life of his wife, before shifting forward 15 years as he continues to investigate the subsequent cover-up. With his estranged son Ford (Aaron Taylor-Johnson) in tow, Joe soon discovers that the cause of the tragedy has returned along with another malevolent beast that could spell the end of humanity. Edwards tries to give the film a human dimension by having most of the action revolve around one family, but Taylor-Johnson, in particular, struggles to convince during these moments and the connection with his own wife and child plays largely second fiddle to the bigger spectacle. But fortunately it’s in the imaginative visuals that Godzilla really scores (even though the monster himself doesn’t occupy much screen-time). A Hawaii-based reveal and subsequent San Francisco showdown genuinely exhilarate and should leave viewers roaring their own approval. General release from Thu 15 May. The world's most famous monster is pitted against malevolent creatures who, bolstered by humanity's scientific arrogance, threaten our very existence. Another big screen outing for the scaly one, this time with Monsters' acclaimed British director Gareth Edwards in charge.